Grease ants next to a penny. 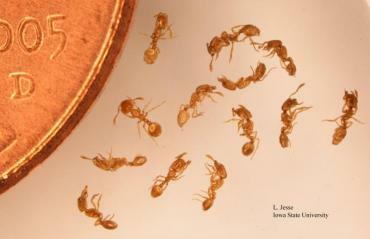 Grease ant is a name commonly used for one of the smallest ants found in homes in Iowa. These ants are technically known as thief ants. They are very small; only l to l.5 mm (1/16th inch)long. They are smooth and shiny and may be yellow to light or dark brown. Indoors, these ants nest in cracks and crevices of walls and cabinets, under floors and behind baseboards. The nests are frequently difficult to locate since the ants travel great distances in search of food. Though they will eat almost anything, these ants prefer to eat grease, fats and meats. Grease ants form a trail from the food to the nest and the moving columns of ants can be located with careful inspection. These ants are very persistent and may be difficult to control. Ready-to-use insecticides applied into cracks and crevices in the vicinity of the nest may be effective, though re-appearance of the ants after a week to 10 days is common. Better control success has been reported when ant bait is used. Artist rendering of a grease ant. Most available ant baits must be mixed with a grease or oil to make them attractive to grease ants. Any grease or oil that can be mixed with the bait should be effective. I suggest vegetable oil, peanut butter or a raw pie dough mixture of shortening and flour. The bait-oil mixture must contain enough grease to be attractive, but not so much as to dilute the active ingredient below where it will be effective. Though exact proportions of the most effective mixture are not known, I suggest starting with one drop or of oil, to 5 to 10 drops of bait. If ants are not attracted to this mixture, try another oil or increase the amount of grease in the mixture. Small amounts of the bait and oil can be mixed together on wax paper and then transferred to the area of ant activity. The bait can be placed on small squares of paper, the non-sticky side of small masking tape strips or directly on the ant trail. Baits must be used with care. Make sure the bait is out of the reach of children and pets. When ant activity has ceased, carefully dispose of the remaining bait.